Last week saw a lot of option activity. Way more than I expected going into the week. Between opening and closing positions there was over 20 different moves that I made last week. Sheesh. Although it was a profitable week so I'm happy with how things turned out. With that many moves to go over I've decided to split up my weekly options recap post into 2 posts; one covering the closed positions and another one coming out later this week that covers the new positions. If you recall back in February United Parcel Service reported earnings and the share price decline significantly. Unfortunately for me the share price dropped all the way through the strike of the put option that I had sold so I became the owner of 100 shares of the company. Since then I've sold puts and covered strangles around the position in order to collect more premium and reduce my cost basis. The covered strangle is created by owning at least 100 shares of a company and then selling 1 OTM put option and 1 OTM call option. Since you sell 2 option contracts you collect more premium than just selling 1; however, that comes at the risk of adding another 100 shares of the company or having to sell the shares. This covered strangle position produced a net profit of $65.82. Based on the additional $10,400 of cash to secure the put side of the strangle that's a rather meager 0.63% return, but it did give a 10.1% annualized return. 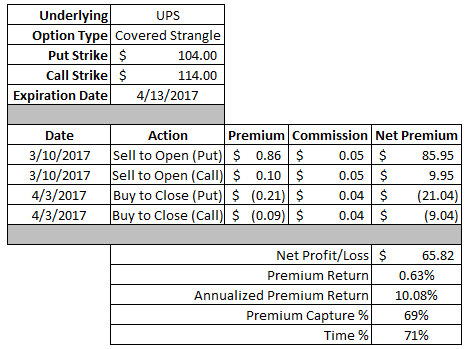 Since becoming an owner of United Parcel Service I've reduced my cost basis through 1 put option and now 2 covered strangles. In total I've my per share cost basis has been reduced by $1.75 by trading options around the position. I will likely refrain from opening another covered strangle position on United Parcel Service since earnings are set to be released later this month. I will be looking for potential earnings related trades, but likely won't make any longer dated plays until post earnings release. Similar to my United Parcel Service position I've been using options as a way to reduce my cost basis on the shares I own in V.F. Corporation. This covered strangle worked out much better than the United Parcel Service one. I was able to collect a net profit of $72.82 or a 1.46% return based on the additional $5,000 of capital to secure the put portion of the contract. The annualized return worked out to an excellent 20.8% return. I was more than happy to close this position out since V.F. Corporation's share price has regularly been testing the $55 strike of the call option which meant I was at risk of having to sell my 100 shares which I don't want to do. Since purchasing the shares in mid/late January I've been able to use options to reduce my per share cost basis by $1.73. I've started to try and incorporate more spreads into my repertoire as opposed to just using cash secured puts. By utilizing spreads you put yourself into a defined risk position, i.e. you know the most you can lose, while limiting your profit potential. While you reduce the amount of credit that you receive you do get the benefit of being able to increase your return on capital. Essentially it goes like this. If Company A sells for $100 per share you could write a put option with a $100 strike, but would need to put up $10,000 to secure the contract if you can not use margin, i.e. retirement accounts. Or you could use that same $10,000 of capital to make different spread positions that have defined risk. 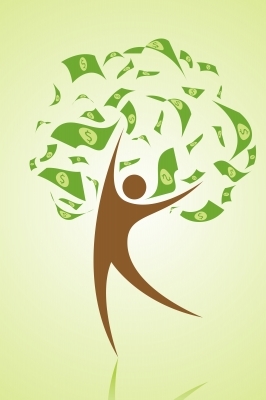 A $1.00 spread only requires $100 of capital to hold the position even in a cash secured account. The risk/reward profile is different for both kinds of trades, but defining your risk does allow for more trades to be put on for the same amount of capital and options trading is all about probabilities which means you need the most number of occurrences as possible. This wasn't the best trade set up that I could have asked for, but I felt it was fairly conservative and was a decent way to tip my toes back into the waters of using spreads. This put credit spread generated a net profit of $45.82 which might not seem like much, but keep in mind that the maximum risk I was taking was $445.09. 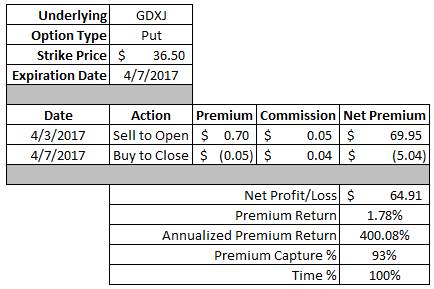 So that $45.82 in profit was a solid 9% return on the maximum loss. I was able to capture 83% of the maximum profit in about 65% of the days until expiration. 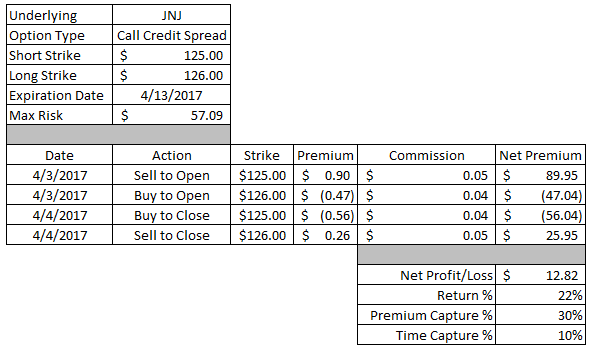 I was quite aggressive with opening this call credit spread with the short $125 strike being just slightly OTM at the time the position was opened. As such I decided to be much more aggressive with closing the position, especially since Johnson & Johnson's share price behaved and drifted lower after I opened the position. This call credit spread provided a net profit of $12.82. Based on the $57.09 at risk, the width of the spread less the credit received, that's a solid 22% return in just 1 day. I was able to capture 30% of the maximum profit in just 10% of the days until expiration. This position took a bit longer than expected to be able to close because it entailed a roll of the original put option back in March. Overall though I can't really complain because I was able to turn a solid profit or would have purchased shares in a wonderful company at a decent price. The total credits received on this position, including the roll, worked out to $134.86. After closing the trade for $50.04 I was able to generate a net profit of $84.82. Based on the $6,000 of capital to secure the contract that's a solid 1.41% return in just over 1 months time. The annualized return came to 14.9%. Over the last couple months I've been using the gold miner ETFs as a way to generate higher option premium. The implied volatility in these 2 ETFs is quite high which means higher option premiums to be had. Plus with the volatility skewed to the upside the call premiums offer very rich premiums in case the shares are put to me. I opened this put option on Monday of last week and by Friday I had the opportunity to close it out and lock in an excellent profit. This put option generated a net profit of $64.91. Based on the $3,650 of capital to secure the contract that's an excellent 1.78% return. Since that return was earned in less than a full week the annualized return is absolutely fantastic at 400.1%. I would have preferred to let this one just go the rest of the day instead of paying to close it; however, the smart move was to go ahead and lock in the profit. The ETF's price was trading right around the $23.50 strike and oddly enough closed trading on Friday exactly at my strike. Since I had rolled this position out in time once already I closed it early to release the capital and lock in gains. This position started back in late February, but was then rolled out in time by the end of the first week of March. The total credits, including the roll, came to $56.66. After buying to close the position I was able to generate a net profit of $51.62. Based on the $2,350 of capital securing the contract that's an excellent 2.20% return. The annualized return works out to 22.6%. In mid March I sold 2 put options on MasterCard with the hopes of having the shares assigned to me. The reason being that it set up so that I could collect the premium from the original trade, collect the next dividend payment and potentially collect 2 call option premiums as well. Well that didn't quite go as planned so I went a different route last week with a buy-write by purchasing 100 shares of MasterCard and simultaneously selling a call option. 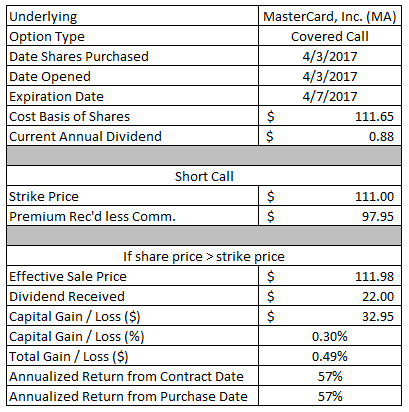 Since MasterCard closed trading above my strike price the shares were called away on Friday; however, I still get to collect the next dividend which will be paid in early May. I purchased shares last Monday at $111.65 and wrote the $111 strike call expiring this past Friday. For selling the call option I collected $97.95 in option premium. My effective sale price came to $111.98 so I only generated a $32.95, or 0.30%, profit from this. Adding in the $22 dividend that will be paid bumps up the return to 0.49%. Ideally the shares would have come back down below $111 allowing me to keep the shares, collect the dividend, reduce my cost basis via the option premium and sell at least 1, possibly 2, call options on MasterCard prior to the shares being called away. Sadly that wasn't the case so I will likely refrain from making any further option moves on MasterCard until the week that earnings are announced later this month. Similar to my strategy with the gold miners I wanted to branch out into a different commodity, silver. On Monday of last week I sold to open a put option on the iShares Silver Trust with an expiration date of this past Friday. Ideally SLV would have closed above the $17.50 strike; however, it ended below and I now own 100 shares of SLV. The strike price of the put option was $17.50, but the premium received when I wrote the contract helped to lower my cost basis. My effective purchase price becomes $17.18. Since this isn't something that I want to own long term my plan is to sell covered calls against this position to reduce my cost basis and have the shares called away. As of now I'm looking at selling a $17.50 call option with a likely expiration date in early to mid May. Hopefully SLV will have move higher in the early part of this week to increase the premium or potentially allow me to sell a $17 strike call to pick up more premium. In hindsight I should have avoided this because the price of the underlying is too low to provide worthwhile option premium. 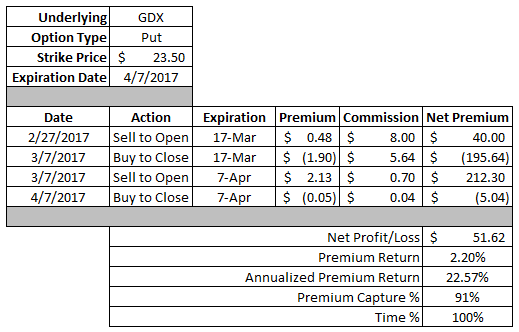 The rest of April should be a busy month as I currently have over $1,900 in potential profits via open option positions. I'm sure I won't be able to book all of that as profits as some positions are sure to go against me and I'll have to roll them out, plus I like to close my profitable positions out early. But if I can capture at least 50% of those potential profits I'll be just happy. Looking forward to this week there's 8 positions that will be expiring on Friday. Some of those, namely my GDX and GDXJ positions are currently trading right around the strike prices which should make for an interesting week. My CVS Caremark covered strangle is for sure going to need some management which will likely entail rolling the put option or the entire position out in time. Thx for sharing. We have similar positions in play!